HELP! Which boutiques should I visit? Ladies! This question seems to be flying around the internet every second! And everyone jumps on board with their suggestions of their favourite shops (which is totally understandable!). And so you end up wih a vague list of probably almost all the wedding dress shops in Adelaide and you’re probably no better off than before you asked the question! The process can easily become overwhelming. Let me save you some time here and give you some suggestions about methods that may help you approach shopping for your wedding dress in a more efficient manner. Note: this is a long post, but I promise, if you’re finding the whole thought of shopping for your wedding dress overwhelming, it will definitely be worth reading! 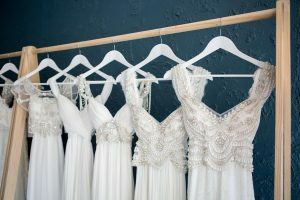 As you may have figured out by now, there are sooooo many wedding dress shops in South Australia, if you went to them all, you (and your bride tribe) would be well and truly over the whole experience and all the dresses would start blending into a never ending sea of white inside your brain! Sometimes by the time you’ve tried on your fourth gown, you can hardly remember the first, so imagine how that would feel after you’ve tried on 30?! 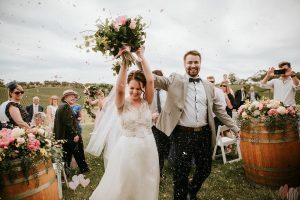 At this point I must add for full disclosure – I did not write this article to try and get every bride into my store… I offer a specialised style and I know that I don’t have the perfect gown for every bride. 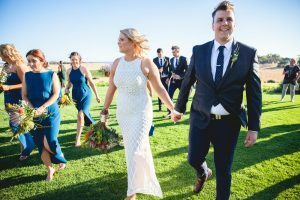 What this article is about, is how you can make shopping for your wedding dress more efficient, and as stress free and fun as possible! Let’s get started! First tip: I wouldn’t suggest starting to seriously look for your wedding dress until you have your venue locked in. This will provide you with two important pieces of information: 1. The setting. 2. The date, and therefore time of year, which may give you an indication of the climate you can expect (although I must say the weather has been all over the place recently so you really can never tell what you’re going to get on the day!). Secondly, have a good think about your own personal style. Do you usually dress in clothes that are classic, trendy, bohemian, conservative, relaxed, vintage, formal, eclectic? Is comfort important to you? How do you want to feel? Do you want to be able to dance? Can you go to the toilet in this dress? (this is a serious issue with some styles of gowns!) Are there particular areas of your body that you would love to highlight? How much are you thinking of spending on your wedding gown? All these little pieces of information will go a long way with helping your stylist make suitable suggestions and help direct your appointments to gowns which will align with your expectations and what you are hoping to achieve. Once you have identified the sort of style that you are drawn to, start researching designers and boutiques that offer gowns which match that particular style (magazines, Pinterest and Instagram are great places to start). A quick look through the website of each boutique you shortlist should give you a good indication of what styles they specialise in. For example, I wouldn’t suggest coming into The Bride Lab if you are looking for a traditional style ball gown, because that is not the style of gowns that we specialise in. Along the same lines, it might not be worthwhile heading into a more traditional wedding dress shop if you are looking for a relaxed, bohemian style gown. 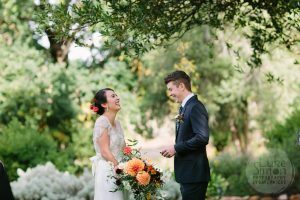 By identifying your own style, and then identifying the boutiques that match your style, you can make your experience less stressful, more fun, and a whole lot less confusing, giving you more time to focus on all the other parts of planning your wedding! Now comes the best part! You’ve done your research, you’ve booked your appointments, and you’re trying on some really stunning gowns that are a great match for your wedding style… How will you know when you have found ‘the one’? Some brides keep shopping because they are waiting for this massive emotional moment when everyone will burst into tears. That doesn’t happen for everyone so don’t worry about a gown not being ‘the one’ if it doesn’t make everyone’s eyes water. What you want is a gown that makes you feel amazing, something that you don’t want to take off, and something that you can imagine yourself wearing on the day that you marry the love of your life! Someone once told me, ‘it’s like committing to your fiancé, once you have found the person that you love, (even though there may be other attractive and intriguing people in the world), you stop looking’!